Size of photo: 2 x 2 inch. Photographed person has to look towards the camera with open eyes. Adjust the head to the horizontal center of the photo. 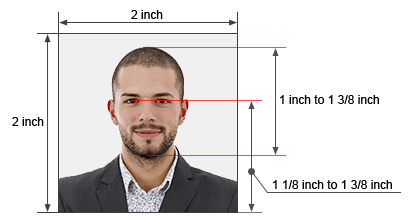 Correct eye height is between 1-1/8 inches to 1-3/8 inches (28 mm and 35 mm) from bottom of photo. Take the photo in front of a white or off-white background. Set the lighting to avoid being shadows on the face or on the background. Photographed person has to has natural facial expression. Opened mouth is not allowed. Requirements are equal to U.S. passport photo requirements. But there are some additional requirements. Only JPEG file format is acceptable. Maximum file size is 240 KB (240 kilobytes). Minimum image dimensions are 600 x 600 pixels. Width and height must be equal. 24-bit color depth photo is required. Another formats are not acceptable. Take a photo according to requirements. Select the photo that you want to upload. After this the Crop page will appear where you can adjust the crop area. On the Crop page you can adjust the brightness and contrast too. Set the resolution to 300 dpi. 150 dpi is too low. If you choose 600 dpi, the file size will be bigger than 240 KB. Click on the Make Photo button in the right-bottom corner. After this the Download page will appear from where you can download your Green Card Photo.